CJ’s Italian Restaurant, St. Simons Island GA – Marie, Let's Eat! Marie’s father has patiently explained the long, strange story of CJ’s to me at least twice and there are still parts that I just can’t recall. Maybe the delightfully eccentric decor and bohemian chic of its owner, Terry Gironda, creates such a casual atmosphere that facts, details and history just become unimportant. It’s one of Dr. Henderson’s favorite places to eat, just a short walk from his house. He’s been a regular since he moved to the island in the late 80s and has seen the restaurant come and go. Terry named her restaurant for her son, who’s now grown and, I believe, living in Arizona. She sold it some years ago, then started a few other restaurants. 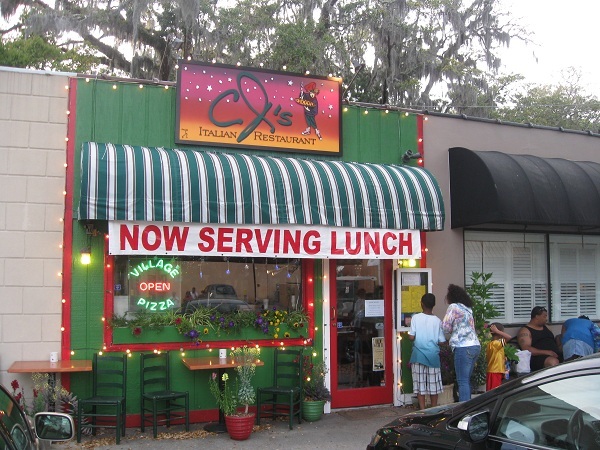 If I understand correctly, when the new owners’ version of CJ’s closed, she moved back to the St. Simons village, but a non-competition clause meant she had to use a new name for a time. That’s when I first met the restaurant, when it was trading under the name Moondoggy’s. Terry built that into a business large enough to grow into a second location in Brunswick, and later sold Moondoggy’s, the name and the second location, to new owners when the clause that kept her from using the name CJ’s expired. It’s a tiny little place, with maybe ten tables, so the turnover is very slow, especially since everything is cooked to order. I’ve never had the pizza here, although it’s said to be wonderful. They do a “magic mushroom” pie with bacon, pine nuts, shrooms, onion and basil with a pesto-based sauce. Had we not enjoyed a pizza the night before in Florida, I’d have wanted to try that. 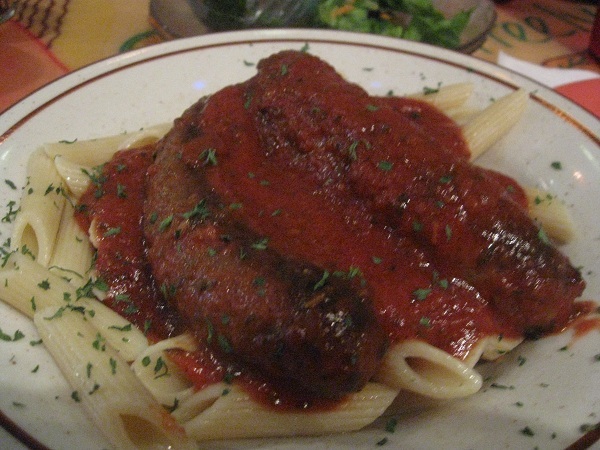 What I ordered instead is the pasta and its really rich, tasty tomato sauce with sausage. A large order of this with garlic “breadstyx” and a salad with some amazing, pink sweet and sour dressing makes for one of the most satisfying meals available on the island. I love this dressing. I can’t think of any dressing I’d rather have on a salad. Why this hasn’t caught on, I can’t fathom. I don’t know that I’ve ever seen it anyplace else. Marie’s dad usually orders the baked spaghetti here. He always seems to be in his element in this tiny little shop with all its delightful, beaded decorations, a cramped place that’s somehow simultaneously dark and shiny. It seems like a perfect place to just take a complete break from everything and cozy up somewhere special. Posted on April 19, 2010 July 16, 2016 by Grant G.Posted in brunswick and the golden isles, georgia, italianTagged brunswick, georgia, italian, saint simons island.